You never pay a % of assets under management. You never pay a % of trading profits. Did we say we were “like a hedge fund?” Never mind. Look through the strategies on the C2 Platform. Turn them on in your regular brokerage account. No minimums. No lock ups. Start and stop whenever you like. Put your strategy on the Collective2 platform. Run your own hedge fund without… um, starting a hedge fund. No heartache. No hassle. Get up and running in minutes, not months. See trades as they happen. Normal hedge funds are “black boxes.” You are not allowed to see the trades that are placed using your money. At Collective2, you can watch every trade as it happens. In real time. Because trades happen in your brokerage account. At Collective2, it’s your money. It stays in your broker account. So when you want your own money, you just take it. At Collective2, you decide how much to invest. Some strategies on C2 require as little as a few thousand dollars of capital. You’re not stuck with losers. At regular hedge funds, you dance with the girl that brung ya’. By the time you’ve invested in a fund, and done diligence, and signed the papers, you’re committed. But a fund that seemed so good a year ago can start to stink quickly. Wouldn’t it be nice to switch managers instantly? C2 is an open platform. Hundreds of strategy managers share their strategies on C2. New ones arrive every day. Hook your broker account to any manager instantly. Don’t like one? Switch to another. It takes about 20 seconds. Do I need to be an “accredited investor”? Who do I write a check to? Who keeps my money? You don’t write a check. You keep your own money in your own brokerage account. What kind of strategies can I select? You can select from strategies that trade futures, stocks, options, or foreign exchange. How can I decide which strategies to use? 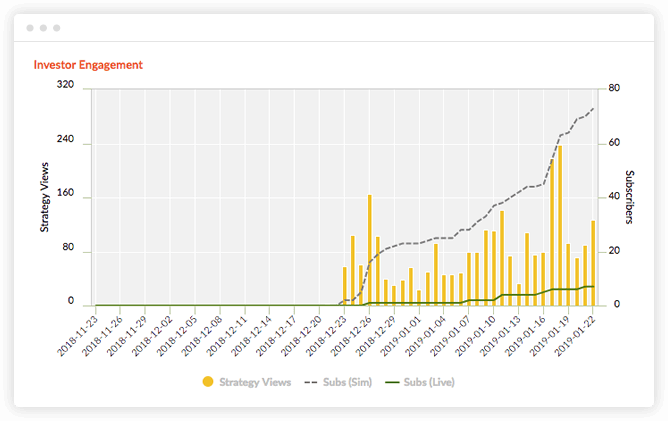 You can see the historical trading records of all the strategies on the Collective2 Platform. This helps you decide which strategies you are most comfortable with. What percentage of profits do I need to pay to you? What percentage of assets do I need to pay to you? Huh? What gives? How do you make money? 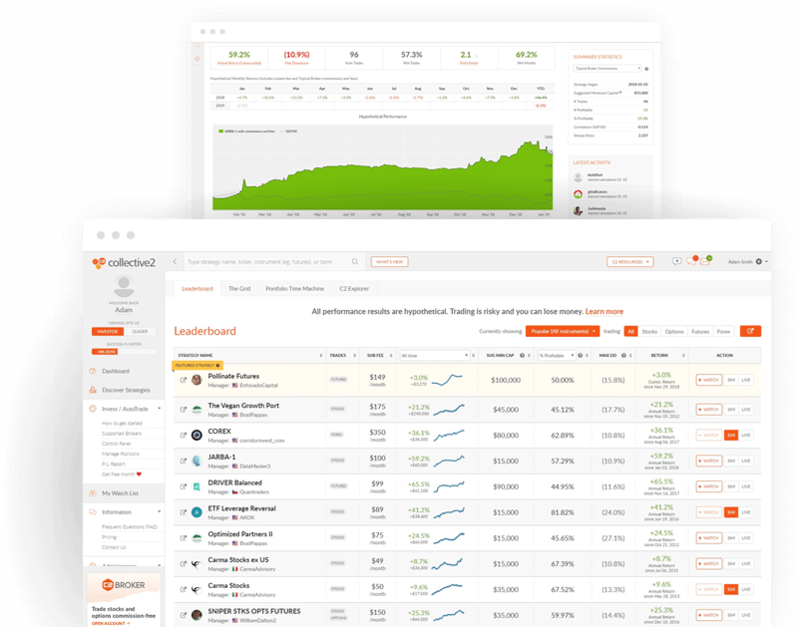 We charge one flat fee for each strategy you want to deploy inside your brokerage account, typically around $100 per month (some strategies are less, some are more.) That fee does not change whether you have a lot of money or a little. You never pay a percentage of profits. Can you guarantee trading profits? Of course not. Trading is risky. But hedge funds can’t guarantee trading profits, either. They can’t guarantee anything, really… except that you will pay them their management fees. An AutoTrade plan lets you automate the trading of any C2 strategy, in any supported broker account. *Plus strategy fees and brokerage commissions. Strategy fees vary and are set by the individual trade leader (system manager). These fees range from $20-$200+/month and can be found on the System Summary page on the Collective2 application. Many strategies offer free trial periods. Brokerage commissions and structures are determined by the individual brokers. Rates are published on the broker's sites. These are costs of investing using strategies on the C2 Platform. Are you a Strategy Manager interested in managing a strategy at C2? Collective2 was founded 18 years ago. It is building a software platform that replaces the entire hedge-fund industry. Whether you are an investor, a strategy manager, or a technology or service provider, we invite you to join us. Together we can tear down the hedge fund industry, and build something better. 1) “Top-performing traders” : Refers only to traders and strategies which have hypothetical results are tracked by the C2 Platform. “Verified track records”: While we verify all strategy performance on a go-forward basis, all results must be regarded as hypothetical. 2) “$75 million dollars between 120,000+ users” : Based on aggregate Net Liquidation Value of all trading accounts connected to C2 AutoTrade Platform as of March 18, 2018, and number of registered users as of March 18, 2018.